So I’ll just cut to the chase and say that I’ve owned the Oculus DK2, the Vive, and Vive Pro. dollars and even then you have it pretty good. The StarVR is definitely not better, and the StarVR one, well who knows. Taking it out of the box, I liked the design overall but not the terrible chevron on the front which I’m unable to turn off (unless you want to turn off the entire headset) and as such now acts like the worlds ugliest night lamp giving my apartment a permanent blue neon tinge. pimax own solution) negates most of that making it pretty decent, I’ll buy some better foam later probably. Also just forget about using this headset out of the box with glasses, it’s just not happening, you’ll ruin your headset or glasses or both. That said once you decide pierce your life long collection of face-spores with the pimax industrial foam that’s glued on your 5 or 8k and slam your nose into the under dimensioned nose well you’re met with the most impressive VR out today. headset, this is incredibly useful for first person shooters and very immersive for other games. 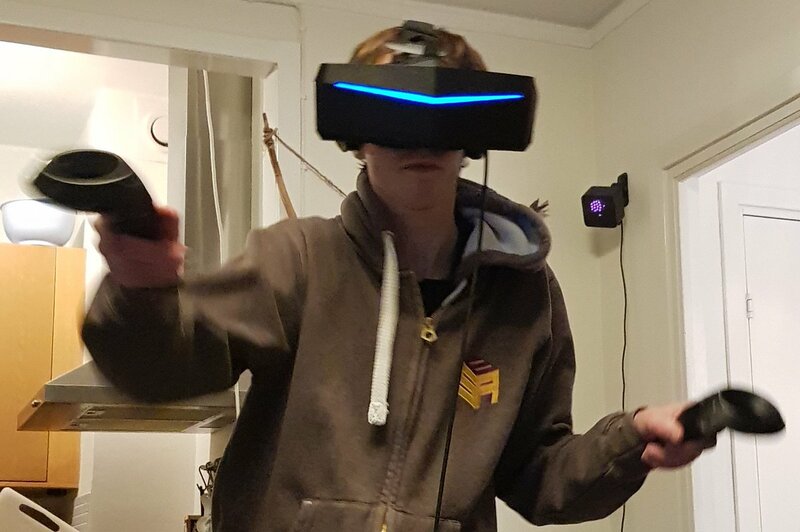 I play mostly Onward, Contractors and Beatsaber and while Beatsaber is very fun in the Pimax, even more so than in any lesser FOV headset (which surprised me), the Pimax really shines in competitive first person shooters such as Onward or Contractors. The extra fov really does give a huge advantage, and the resolution of the 5k is still among the best of all current gen HMDs. Also I’m adding the software to good things because even though it’s not quite there yet, the difference between issues today, to when I got it is huge, I estimate that almost 70% of the original distortion is gone, and so is all the issues I had with initial instability of the headset. The developers doing software are incredible and I fully believe that if there are some minor issues still that these will be fully resolved soon. Pimax have also been very open to suggestions from the community and often add features that the community wants. A huge thumbs up on this. Great headset, requires some extra fixes to be comfortably used, it will probably break my nose, but a fantastic experience that I’m extremely happy with. I would like to add, that once I got to try the 8k I liked it over the 5k.